2016 $50 Gold Eagle Proofs! With the introduction of the Gold Krugerrand in 1967 and the Gold Panda in 1982, the world got hooked on gold coins. To compete with these coins, the U.S. Congress authorized the U.S. Gold Eagle program. The coins were minted in 91.7% gold, with each coin containing a full ounce of pure gold. The first coins were struck in 1986, in both Brilliant Uncirculated and Proof condition. The proofs were minted at the West Point Mint. 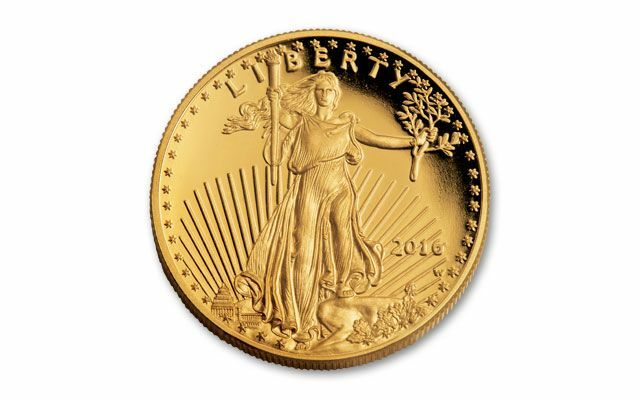 For the coin's obverse, the mint adapted the image of Miss Liberty from perhaps the most famous previous U.S. gold coin, the $20 Saint-Gaudens Gold Double Eagle. For the reverse, they chose the image of a family of eagles in their nest. Since 1986, these one-ounce Gold Eagle Proofs have become extremely popular with collectors. The mint prepares special dies and planchets, and strikes each proof at least twice under massive amounts of pressure to assure the highest possible collector appeal. Today, one-ounce Gold Eagles are highly sought after by collectors trying to complete their collections. Because the mint is not required to strike Proof Gold Eagles, they can stop striking them at any time. It's important for collectors to purchase them when they are available. 2016 marks the 30th anniversary of the $50 One Ounce Gold Eagle. This anniversary increases collector interest and demand. You can secure your 2016 Proof Gold Eagles right in the original government packaging. Call now! ANNIVERSARY: Back in 1986, the U.S. Mint unveiled the first Gold Eagle and 30 years later the U.S. Mint continues to strike these beautiful coins for collectors. PROOF: Proof coins are struck especially for collectors and usually in much smaller quantities than their Brilliant Uncirculated counterpart. Proof coins are the envy of all collectors due to the attractive eye appealing mirrored look. 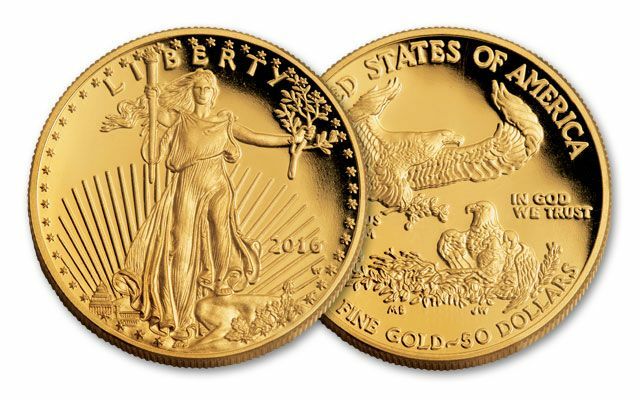 MINTAGE - PROOF VS BU: Recent records indicate that the 626,500 BU $50 gold eagles were struck in 2015 compared to 22,734 Proof $50 gold eagles - that's over 27 times more! DESIGN: The beautiful obverse is revised edition of Augustus Saint-Gaudens Standing Liberty design. Originally used on $20 Dollar gold pieces minted from 1907 to 1933. The reverse is an Eagle landing on a nest, with family of Eagles. HIGH GOLD CONTENT: High gold content - every coin is .9167 gold. GRADE: Collectors always look for the highest quality. Each coin is in Proof, PF69 or PF70. FIRST RELEASES: Each graded coin is designated as "First Releases." This is the pinnacle of a coin's state of quality. It just doesn't get any higher than MS70 First Releases. Collectors believe they are the most detailed strikes off brand new dies, which adds to the coin's appearance and value. GRADING SERVICE: The graded 2016 $50 Gold Eagles are authenticated, graded and encapsulated by NGC, one of the leading third-party coin grading services in the world. CUSTOM LABEL: Our 2016 $50 Gold Eagles feature a custom label in each NGC slab exclusive to us.